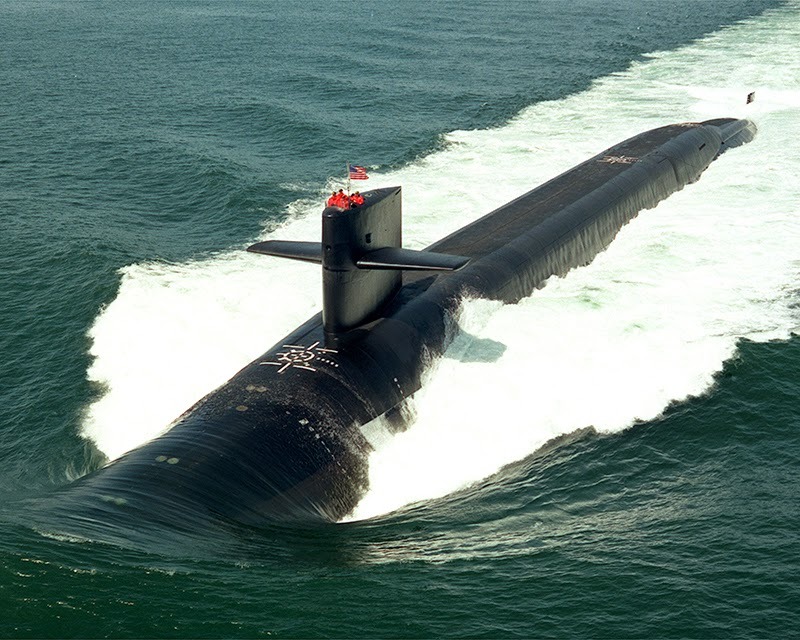 General Dynamics' Electric Boat division is seeing dollar signs... no, make that billions of dollar signs as plans for a new generation of U.S. ballistic missile submarines move forward at all possible speed!!! Electric Boat has a contract with the Navy worth up to 2.3 billion to manufacture the common missile compartment (CMC) tubes for the 12 New Trident submarines as well as the UK's 4 new ballistic-missile submarines, along with extra tubes for an onshore test facility. Of course, this is just the beginning for Electric Boat, which will involve the lion's share of work on the New Trident subs. As the following article explains, the State of Connecticut is giving Electric Boat a generous 10-year, $10 million loan to help the company out with its expansion of its submarine production facilities while parent General Dynamics' earnings have risen while revenues have held steady at $7.75 billion! The nation's whirlwind nuclear modernization effort is a boon to General Dynamics, the State of Connecticut, and of course the members of Congress who ensure that valuable tax subsidies are maintained for companies like Electric Boat. The OHIO Class submarines are massive boats carrying massive thermonuclear destructive power in their missile tubes, and the nation can afford neither the astronomical cost of construction (estimated at $100 billion or more) nor the huge risk borne not only by U.S. citizens, but by all of humanity should those missiles (with their multiple thermonuclear armed warheads) ever be used. New Trident will only accelerate the growing nuclear submarine arms race, a race in which there will be no winners, only losers. General Dynamics' submarine-making division Electric Boat, which won a $17.6 billion Navy contract this year for construction and delivery of Virginia Class submarines, will invest $31.5 million to expand its Connecticut production facilities. Electric Boat is also expected to create 200 new jobs in Groton, Connecticut, where a company facility currently employs 8,700. Connecticut's Department of Economic and Community Development is providing Electric Boat with a 10-year, $10 million loan as part of the expansion, a loan it won't have to pay back if it meets its new employment target. "Today's announcement supports the required facility expansion that will help Electric Boat affordably deliver submarines to the U.S. Navy," said Electric Boat president Jeffrey Geiger in a statement. The expansion will accommodate both Virginia Class production and the Ohio Class replacement program, the newest class of submarines. The expansion includes Electric Boat's acquisition of land and buildings currently owned by Pfizer Corporation, as well upgrades to its existing facilities and equipment. Jeff Clabaugh covers general assignment and provides business coverage for WTOP.